An exclusive shade made especially for A Box, Indied August Edition (a monthly subscription box filled with fabulous polishes from indie brands), Food Fight is a gorgeous blue-gray crelly (creme-jelly hybrid) filled with shiny blue hex glitters, iridescent glitters, and holographic specks. When I first saw the color I was a bit underwhelmed because the polish kind of reminds me of mushy cafeteria slop, but when I actually applied it on nails I ended up really liking the color. I love the dimension all the different glitter bits created and the formulation is very good despite being a tad sheer. I used three coats for the photos below. 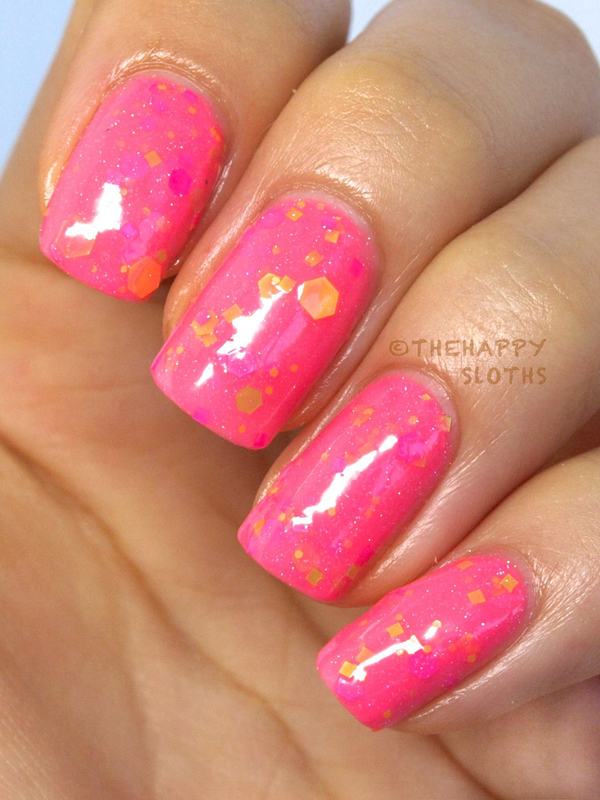 From the same 80's Girl Bands Collection as those crazy holographic polishes I reviewed last week, Neutron Dance is a crazy bright pink crelly filled with bright yellow, pink, and green glitters with a dash of holographic specks. The formulation is a tad thick but the thickness does help carry the glitters out of the bottle, no glitters-fishing needed here. I used three coats for the photos below. Unique crellys polishes like these are the reason I love indie polishes. Food Fight! is such beautiful blue-gray and the bright and crazy glitter combo of Neutron Dance makes it perfect for the summer time! Food Fight! is available exclusively in the August edition of A Box, Indied, available on Llarowe. Neutron Dance is available right now at Girly Bits.